Ah, painting a pet. It is one of the dreams that shine in the eyes of practically every Neopian, whether they are a veteran player or a newbie. It is such a thrill to see your beloved pet dive into the rainbow pool with paintbrush in hand and moments later emerge with a completely different appearance. It is quite a wonderful event to experience in your time in Neopia. It can be quite a strange event too. 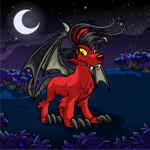 It is strange because the color change often seems to change more than just the pet's color. These changes can be as simple as a pirate pet starting to use a pirate dialect or as complex as the whole pet's body changing form, which occurs quite often in Chias and JubJubs. In my time in Neopia, I have found these changes to be quite intriguing. Recently, my curiosity got the better of me, and so I set off on a quest to study painted pets and their curious colored characteristics (try saying that three times fast). My pets offered no help in my quest. They were all for helping me at first, but the moment I mentioned that there might be some mischief involved, their schedules suddenly filled up. They can be just a little too kind-hearted sometimes. Instead, I enlisted the aid of my pet Star's faellie, Angel. Her name is quite deceptive, as she is very drawn to mischief. Thus, we set off to study the first pet on my list, the cloud JubJub. Cloud JubJubs are very strange and different from other cloud pets. When most pets are painted cloud, their body turns a light blue color and they gain cloud markings. When a JubJub is painted cloud, they turn completely into an adorable little cloud, with only their feet and facial features remaining. Like I said, it is strange. After a little interactive investigative work, we managed to answer five main questions. 1. Do cloud JubJubs rain if they cry? When I think of clouds, one of the things I think of is rain. Thus, this was easily the first question on my mind. In order to find this out, Angel and I chose a younger cloud JubJub to study. We figured they would be easier to spook into tears. We found the JubJub while watching the rainbow pool. She was freshly painted, which caused her to be too excited to notice when we happened to follow her and her owner out among the main shops. Upsetting her was simple enough, as her owner led her farther through Neopia Central and into the toy shop. She wandered away from her owner, as young pets have a tendency to do, and was browsing the shelves all by herself. The toys thoroughly excited her, and she spent some time gazing at each one. I figured that the best way to upset her was to make her owner upset with her by using the toys. So, I planned to wait until she ran to get her owner in order to plead for a new toy. When she was gone, Angel and I would remove the items from the shelf. Once the owner had come and seen the empty shelf and left, we would replace the toys so that the JubJub would see them once more and go bother her owner again. We would continue this process until the owner became furious with the pet and the pet became furious with the owner and the disappearing toys. Now, I hate to upset pets, and felt guilty knowing that I was about to thoroughly upset this young JubJub, but it was the only way I could answer my question. Everything went as planned, and after about the third time that the JubJub fetched her owner, her owner was quite irritated. There was a little bit of yelling involved, and a lot of crying. It turns out that JubJubs do rain when they cry. It pours outward from all sides, though, since it cannot go straight down. After a few tears, we approached the JubJub with the toys and apologized for moving them around. We told her that we simply could not decide whether we wanted them or not. The JubJub was furious. It turns out that cloud JubJubs also storm when they are really upset. We have a few lightning burns to prove it. 2. Do cloud JubJubs float like actual clouds do? In slight pain, we continued on with our next question. As I had never seen a cloud JubJub lift off the ground while wandering the streets of Neopia Central, I assumed that a fair amount of wind was required for them to get airborne. Having no wind-producing abilities of my own, I decided to use those of the lovely Tornado in a Bottle. After hunting down another cloud JubJub (the other one threatened to unleash more lightning bolts on us if we ever came too close to her again), we followed him into a nice open field. He was planning on having a picnic, but I am afraid it never happened. Once we were in the field, at a good fifty foot distance from him, we "accidently" dropped the Tornado in a Bottle and ran quickly away. It was a mess in seconds. The tornado took away all his picnic supplies and tore up a massive amount of field grass. We got our answer, though. In the minute that the storm lasted, with its brutal winds blowing everywhere, the JubJub lifted about five feet off the ground. As soon as the storm was over, though, he came right back down. So no, cloud JubJubs, despite their cloud-like shape, do not float like actual clouds; they simply lift off the ground a bit better than your average pet. Our educated guess on the matter is that their feet, which are not clouds, drag the JubJubs down. We also guess that not many pets will be picnicking in that field again anytime soon. 3. Can cloud JubJubs change shapes like clouds can? This question did not require the complete sneaky behavior that the other questions involved. We happen to know one cloud JubJub, who was more than happy to help us out. We saved her for this question because we knew it wouldn't cause as much trouble as the others. We knew that we would see her quite often, and we did not want to have to endure constant angry stares every time we saw her. To answer this question, we simply grabbed some grooming tools and went to work trying to shape her. It turns out that cloud JubJubs cannot fully change shape. It seems that their bodies are too dense to enable shaping. The outer wisps of cloud, which are about six inches long, did allow shaping into simple shapes, though. The outer wisps seemed to be like the JubJub's fur, or hair, because of this. Of course, the hair resemblance of those outer wisps brought about further curiosity on the matter. Thus, we followed through with a few extra experiments on a few other cloud JubJubs. Needless to say, the results were not too pretty. We did find out that you can eliminate the cloud wisps by using lawn mowers and other items that can widely disperse the wisps. Apparently they do not reattach and grow back at an extremely slow rate too. Anyway, if any angry cloud JubJubs missing their outer cloud wisps ask if you have seen Angel and me, please just ignore them or at least give us fair warning before unleashing the fury of the clouds upon us. 4. Can cloud JubJubs snow in cold weather? Since it was determined that they could rain and storm, we wanted to know if their abilities extended to include snow. Now, we knew that cold weather would be required in order to accomplish any form of snow. We also happened to catch word while we were wandering about that a cloud JubJub and its owner were about to leave for a wonderful winter vacation atop ice cold Terror Mountain. It was all so perfect. We just needed to figure out how to upset the JubJub once we arrived there. So, we packed our bags and headed for the mountains, ready to formulate a plan and take action as soon as we found out more about the JubJub in question. Lucky for us, as soon as we reached the top of the mountain and laid our eyes upon the JubJub, we discovered it was none other than the cloud JubJub we upset in the toy shop not so long ago. She recognized us as soon as she saw us, and immediately became furious. This of course worked perfectly in allowing us to gather the answer we needed. The cloud JubJub's body grew very dark and suddenly started shooting out snowflakes. Unfortunately, she was still so furious from the toy shop incident that we discovered more than we bargained for. She not only started snowing, but caused a minor blizzard that completely surrounded us. We woke up in the hospital days later with serious cases of Neomonia. It definitely delayed the remainder of our studies on cloud JubJubs, as they would not let us leave the hospital for days after that. We eventually did get out, though, with only a minor illness still plaguing us. 5. Does anything affect a cloud JubJub's size or density? We were not up to much experimenting after our hospital visit, but we felt the need to answer this one last cloud JubJub question before wrapping up our investigation. So, sniffling and sneezing, we rounded up a few last cloud JubJubs to test our theories on. We did a few simple experiments, which involved making them hold their breath, drink a few different beverages, and eat a few different types of food. We also tested what would happen if they were deprived of liquids for a while, seeing as liquids are so essential to clouds. We found that air and liquids affected their size. The more they took in, the bigger they got in both cases. In the case of liquids being kept from them, they grew steadily smaller the longer they went without anything to drink. Food seemed to affect their weight, as with most pets, and also affected their density. The density of the food item added almost directly on to their density. The effects faded as soon as they were hungry again, though. There was not too much mischief involved. We were too ill to cause much. Angel, always longing for mischief, caused a bit of trouble, though. For experimental purposes, we blindfolded the JubJubs and did not tell them what they were eating or drinking. Thus, Angel thought it would be a brilliant time to add some rather gross items to the mix. I found out about her mischief when the JubJubs started suddenly complaining about tastes of dung and slime. That is definitely the last time I ever leave Angel in charge of running an experiment while I record data. She just loves trouble too much. So, our investigation into the mysteries that are cloud JubJubs wrapped up. We learned a lot, and hope that you might have gained a further understanding of this interesting pet through our work here. Now, if you will excuse us, we are off to investigate even more strange and mysteries colors. Hopefully we will be around again soon with even more intriguing information for the citizens of Neopia. That is, if all those angry cloud JubJubs do not catch up with us first.